By night, Gaby streams Magic on Twitch. By day, she's co-founder and VP of Content at Dose, the Chicago-based media company behind Dose.com and OMGFacts.com. I learned how to play Magic playing a core set, so I'm a huge fan and excited for their return! Core sets don't usually have strong themes. They provide a nice opportunity for new and experienced players alike to draft decks in any color combination they want. That said, core sets can often have sub-themes, and the Knight tribal theme from Dominaria continues here. Let's say hello to the Knights of Core Set 2019! I'm in love with the way Lena, Selfless Champion works. She is expensive, but her effect is awesome. If you are ahead and you cast her, your opponent is straight-up dead. If you're in a board stall, she can help break it by creating tons of 1/1 Soldier creature tokens. If you're behind, she's actually not great, which is a bit unfortunate. She does count herself, so at the very least you're getting Lena and one Soldier, but paying six mana for 4 power worth of creatures is not a great deal. Her second ability I think is awesome and flavorful. You can sacrifice Lena to protect creatures smaller than her. This is nice, because after her enters-the-battlefield effect makes you tokens, you might want to send those tokens into the fray. Sacrificing Lena is not a huge cost, since she's only a 3/3. Your opponent might have to make some unfortunate blocks since you can threaten to activate her, which gives you a nice advantage. 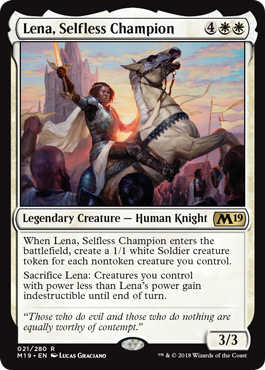 I really wish Lena, Selfless Champion made 1/1 white Knights tokens, but unfortunately, she makes Soldiers, which means that Valiant Knight is not exactly a combo with her. Valiant Knight does pump Lena herself, so that is a nice little bonus. 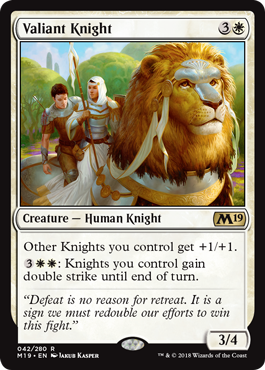 I'm really digging Valiant Knight, since it's a reasonably priced creature in its colors with a really nice ability if you draft other Knights. Not just that, Valiant Knight is able to give double strike to itself with its second ability, which makes blocks a nightmare for your opponent. Lastly, we have the Sigiled Sword of Valeron. This Equipment is not cheap: three mana to cast it and three to equip a creature. Luckily, we are a getting a good effect for the price. The equipped creature gets +2/+0, vigilance, and is a Knight in addition to its other types. Once you attack with the equipped creature, the gravy train with biscuit wheels starts rolling. 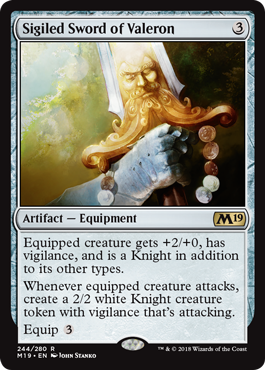 You get to summon a 2/2 Knight with vigilance that is also attacking, which forces the opponent to deal with the Sword or get buried under an avalanche of card advantage. You don't need to connect many times with this Equipment before the game is locked up in your favor. It's also nice that if your original creature died in combat, the Knight it helped summon can now wield the sword. These cards will be a lot of fun in Draft and fit into Brawl decks nicely. What are some of your favorite cards from Core Set 2019 thus far? Are you planning on building any sweet Knight decks with these? You can let me know on Twitter @gabyspartz or on my stream at twitch.tv/gabyspartz. Enjoy!